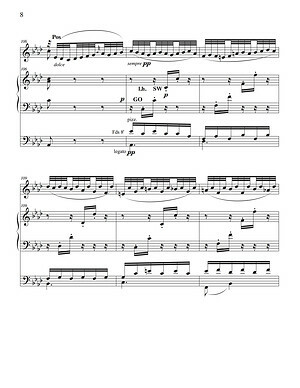 Back in 2012, I arranged the second movement from Beethoven's Fifth Symphony for organ as part of my D.Mus. thesis. In order to incorporate as much as possible of Beethoven's orchestration, I included many passages for double and triple pedal, but all of them had to be played on the same registration - which meant that it was impossible to single out melodic lines in the right foot, or use the 16' (or 32') stops in the left foot. One of the amazing new features of the Syndyne control system in our renovated Klais/Schlueter organ (IV/112) at First Presbyterian Church of Atlanta is a pedal divide with programmable splitting point. I made some revisions to incorporate the sonic possibilities of the pedal divide into the arrangement, with the splitting point between e flat and e natural. The result is stunning, this adds a whole new dimension to the registration/orchestration! I will perform the premiere of this updaed version will be on Tuesday, March 12, at 7:30pm at First Presbyterian Church of Atlanta. Admission & parking are free, the full concert program is available here.